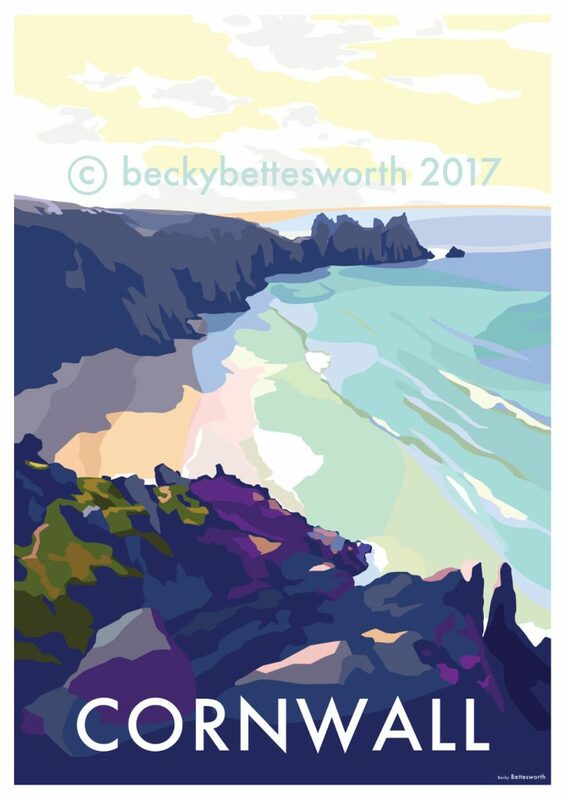 When we started searching for an image to support the North Cornwall walk during Seaside Walk Week we came across the work of Becky Bettesworth and loved it! We are delighted that Becky has agreed to let us use one of her paintings to help promote the event. Seaside Walk Week takes place between 22 and 30 July, with the final official walk taking place on Sunday 30 July in North Cornwall, starting and finishing at the stunning Mother Ivey’s Bay. Becky lives and works in South Devon, and has produced some stunning work inspired by the beautiful South West landscapes. Becky’s work draws inspiration from the classic railway posters of the 1930s. Her vintage seaside posters are modern and fresh, showing a place off at its best, without the fuss and rush of the modern world. You can view more of Becky’s work online here.